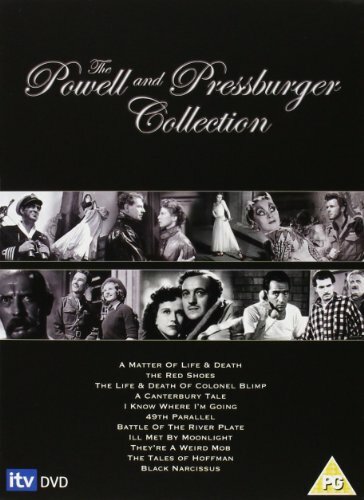 Collection of eleven classic films from influential filmmakers Michael Powell and Emeric Pressburger. 'The Battle of the River Plate' (1956) tells the true story of the famous 1939 naval battle. Hans Langsdorff (Peter Finch) is captaining the crack German battleship Graf Spee through the South Atlantic, unaware that a small number of lightweight British battle cruisers are hot on his trail. When the British cruisers manage to trap the powerful German ship in the Uruguayan harbour of Montevideo, they attempt to trick Langsdorff into believing that an entire battle fleet is waiting to destroy his vessel at sea. In 'A Canterbury Tale' (1944), a British sergeant, a land girl and a United States Army officer arrive at a Kent village on the same train. The newcomers are brought face to face with the bizarre menace causing bewilderment in the tight-knit community: someone is pouring glue onto the hair of girls who dare to venture out at night with visiting servicemen. Powell and Pressburger offered this 'propaganda' piece as their contribution to the war effort, but the authorities were unsure how its oddball tone would go down with the Allies. In '49th Parallel' (1941), Laurence Olivier and Leslie Howard are among the stars who try to prevent Nazi sailors, from a sunken U-Boat, reaching neutral USA through Canada in this classic war film, which was intended to persuade America to join World War II. Pressburger won an Academy Award for the story and the film was directed by Powell. In 'I Know Where I'm Going!' (1945), a woman (Wendy Hiller) has always known what she wanted in life, and now she is about to marry a millionaire. But when she ends up stranded on a Hebredian island due to a storm, she begins to see things a little differently. 'Ill Met By Moonlight' (1957) was the final film created by Powell and Pressburger together. Set on the island of Crete during the Nazi occupation, the film stars Dirk Bogarde and David Oxley as British officers assigned to kidnap the German commander-in-chief General Kreipe (Marius Goring) and spirit him back to Cairo. If successful, the morale of the Germans would be weakened and the resistance would be stronger. But once he is captured, the British officers have to get him past German patrols at almost every turning. In 'The Life and Death of Colonel Blimp' (1943), stuffy ex-soldier Clive Candy (Roger Livesey) recalls his career which began as a dashing officer in the Boer War. As a young man he lost the woman he loved (Deborah Kerr, who plays three roles) to a Prussian officer (Anton Walbrook), whom he fought in a duel only to become lifelong friends with. Candy cannot help but feel that his notions of honour and chivalry are out of place in modern warfare. The film's title comes from 'Evening Standard' cartoonist David Low's satirical comic creation, Colonel Blimp. In 'The Red Shoes' (1948), ballet impressario Boris Lermontov (Walbrook) hires up-and-coming ballerina Victoria Page (Moira Shearer) and talented young composer Julian Craster (Goring) to work with him on a new ballet, an adaptation of the Hans Christian Andersen story 'The Red Shoes'. The show is a great success and Victoria and Julian fall in love, but Boris is jealous and makes moves to spoil their happiness. 'A Matter of Life and Death' (1946) is a classic wartime propaganda movie, commissioned by the Ministry of Information, but turned into a fantastical allegory by the Archers, aka Powell and Pressburger. David Niven plays an RAF pilot who is ready to be picked up by the angels after bailing out of his plane. But an administrative error in Heaven leads to a temporary reprieve, during which he must prove his right to stay on Earth. A tribunal in heaven ensues to decide the case. In 'They're a Weird Mob' (1966), Nino Culotta (Walter Chiari) is an Italian immigrant who arrives in Australia with the promise of a job as a journalist on his cousin's magazine, only to find that when he gets there the magazine has folded, the cousin has done a runner and the money his cousin sent for the fare was borrowed from the daughter of the boss of a local construction firm. 'The Tales of Hoffman' (1951) is an adaptation of Jacques Offenbach's opera and follows Hoffman's (Robert Rounseville) tales of his love for the doll Olympia, the courtesan Giuletta (Ludmilla Tcherina) and the frail diva Antonia (Anne Ayars), and of how his quest for the eternal woman was always thwarted by evil. Finally, in 'Black Narcissus' (1946), a group of British nuns are sent into the Himalayas to set up a mission in what was once the harem's quarters of an ancient palace. The clear mountain air, the unfamiliar culture and the unbridled sensuality of a young prince (Sabu) and his beggar-girl lover (Jean Simmons) begin to play havoc with the nuns' long-suppressed emotions. Whilst the young Mother Superior, Sister Clodagh (Deborah Kerr), fights a losing battle for order, the jaunty David Farrar falls in love with her, sparking uncontrollable jealousy in another nun, Sister Ruth (Kathleen Byron). Collection of eleven classic films from influential filmmakers Michael Powell and Emeric Pressburger. 'The Battle of the River Plate' (1956) tells the true story of the famous 1939 naval battle. Hans Langsdorff (Peter Finch) is captaining the crack German battleship Graf Spee through the South Atlantic, unaware that a small number of lightweight British battle cruisers are hot on his trail. Finally, in 'Black Narcissus' (1946), a group of British nuns are sent into the Himalayas to set up a mission in what was once the harem's quarters of an ancient palace. The clear mountain air, the unfamiliar culture and the unbridled sensuality of a young prince (Sabu) and his beggar-girl lover (Jean Simmons) begin to play havoc with the nuns' long-suppressed emotions. Whilst the young Mother Superior, Sister Clodagh (Deborah Kerr), fights a losing battle for order, the jaunty David Farrar falls in love with her, sparking uncontrollable jealousy in another nun, Sister Ruth (Kathleen Byron). The Red Shoes: Biographies, Stills Gallery, Theatrical Trailer, Documentary and Featurette. The Battle of the River Plate: Cast Biographies. The Life and Death of Colonel Blimp: 25 minute documentary including interviews with Jack Cardiff and Stephen Fry. A Matter of Life and Death: Short film about Jack Cardiff. Ill Meet by Moonlight: Theatrical Trailer. All subtitled except A Canterbury Tale.